Nell Gwyn was born Eleanor Gwyn in Hereford, England in 1650 in a small house off of Drury Lane. Her mother, Rose, was imprisoned when Nell was young, and she was frequently visited by theater owner Thomas Killegrew. Killegrew may have used his influence to land thirteen year old Nell her job as an orange seller at The King’s Theater. Mrs. Mary Meggs (the Orange Moll) had a license to sell “oranges, lemons, fruit, sweetmeats and all manners of fruiterer’s and confectioner’s wares”. For the privilege of selling inside the theater, Mary paid the theater six shillings and eightpence every acting day. The price of oranges was sixpence and a gentleman never haggled over the price. Orange sellers were usually pretty girls who could flirt (and sometimes more) with the audience and Nell’s quick wit made her a favorite with the men. After becoming the mistress of Charles Hart, an actor, she was trained for the stage and made her debut in 1664 in Dryden’s play, The Indian Emporer. She was best known for her comedic parts and her success was largely attributed to Dryden who seems to have made a special study of her airy, irresponsible personality. She excelled in the delivery of the risqué prologues and epilogues which were the fashion and the poet wrote for her some specially daring examples. Nell left the theater in 1669 after a career of only five years to become the mistress of Charles II. She was obviously missed however given the fact that one her most famous roles in the play Secret Love was not performed again until 10 years after Nell’s performance because apparently the audience would not accept any one else in lead part. At the age of 19 she attended a play with a suitor and found herself seated next to the King. It is said that her witty remarks during the play led him to invite himself to dinner with her and her date after the show and Charles II went so far as to invite one of his stewards to ensure that Nell’s date would be occupied. Charles II had several mistresses. His steward, Mr. Chiffinch, arranged the schedule by which his mistresses moved in and out of his palace at Whitehall. 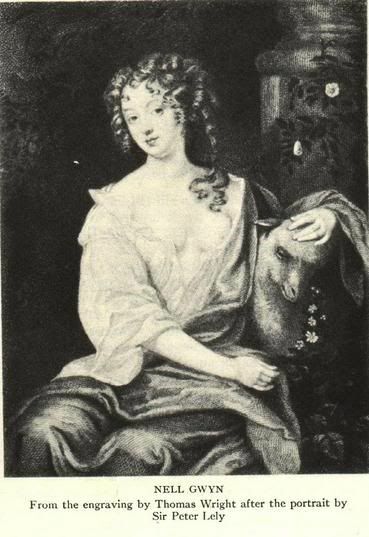 Due to her beauty and great sense of humor, Nell became a favorite mistress in the public’s eye which made her the target of opposition from Charles’ other mistresses, especially Louise de Keroualle. Nell’s name for Louise was Squintabella because of a slight defect in one eye. She also called her “weeping willow” because Louise would use tears to get favors from the King. Both names infuriated Louise but amused Charles. Evidently Nell had a wicked sense of humor as noted in the following escapade. Hearing that one of Charles’ other mistresses was due to sleep with the king on a night in early 1668, Nell invited her to eat some sweetmeats she had prepared. Unknown to the other mistress, Nell had mixed in a hefty dose of the laxative jalap. The night did not go as planned for the King. As Charles’ mistress she bore him two sons, both of whom received titles from the king. Nell did not interfere in matters of state though it is said that it was her influence that led Charles II to found the Chelsea Hospital for wounded War Veterans. Though Charles did not bestow a title on Nell, his deathbed wish to his brother was said to be, “Let not poor Nelly starve”. James II faithfully carried out his brother’s wishes by supplying her with a pension until her own death two years later of either a stroke or syphilis. “Pretty, witty Nell” as she was known was said to have been a true child of the London streets who never pretended to be superior to what she was. She never forgot her old friends, and, as far as is known, remained faithful to her royal lover from the beginning of their intimacy to his death, and, after his death to his memory. I would like to have known her too, gilly or at least read more about her. She sounds like she had a lot of...what's a good word...life and fun in her? I've always loved Nell since I first read about her while reading the trilogy of books on Charles II by Jean Plaidy, she was of course the fictionalized version but I have read about her since and it was not far off how she was in reality. she was a great friend of Rochester and was even caught up in plots with him to make sure the succession stayed Protestant by supporting Charles's illigitamate son James Duke of Monmouth. Nelly also refered to Charles as Charles III as he was the third lover she had had called Charles. While I was trying to find the quote abouve I came across a little poetry from Rochester on the demise of Nell's mother.